This fungus disease is one of the most common and destructive diseases of apple trees, it may also affect pears, beech, ash, poplar and sorbus. The fungus enters in spring through wounds, possibly caused by woolly aphids. It may also enter through cracks, leaf scars and wounds caused by pruning. In summer spores of the fungus appear as white pustules on the sunken bark,these spores are then washed by rain into cracks and wounds. In winter small red bodies, which contain the winter-resting spores are spread by wind into similar entry points in the bark. The infection girdles the branch/trunk sometimes killing small fruiting spurs. On larger branches the disease appears as rings of dead bark. With older cankers the bark falls off exposing dead wood within the branch/trunk. Perennial cankers are formed of gnarled raised growths where the bark has tried to regrow over the affected areas. Eventually the affected branch/trunk will die above the canker formation. Small branches or spurs infected by canker can be cut out and burnt. 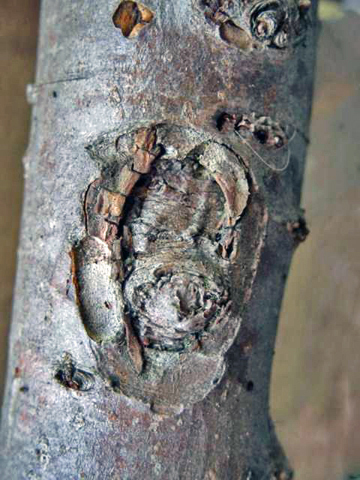 With larger branches and main stems, the brown diseased areas should be cut out with a sharp knife until a clean white or green-white wound is left. Paint the wound with white-lead paint or grafting wax, or proprietary canker paint. In severe attacks, spray the trees with Bordeaux mixture or liquid copper, after the fruit is picked, but before leaf-fall, then again when half the leaves have fallen, and finally the following spring at bud-swelling stage. Heavy, waterlogged acid soil may aggravate canker, with some varieties being more susceptible than others. Improving the drainage and raising the pH level will help.